I've seen it all before, these crazy gadgets to make your own frit. that's enough to scare you from jumping into doing this yourself. there has to be an easier and safer way to make your own frit. A little experimenting and EUREKA, I've got it!!!! Pull out that old blender you were planning on selling at your next garage sale!!!!! Add some glass to your blender. 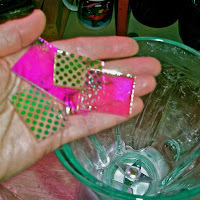 If you're using dichroic glass, l like to use the thin clear glass. It adds amazing little flashes of color between the layers. There's no special formula or amount, because you'll drain the water out at the end. ***The water is very important here because it keeps the glass dust from floating around. If you haven't already heard, glass dust is very dangerous to your lungs. Turn on the blender. It's amazing!!!! The blender cuts right through the glass. Now go into to your pile of mismatched socks. Place one sock over an empty cup. Put it down a little in the center top. Swirl the water and the ground glass. 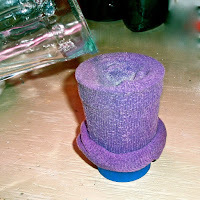 Now slowly pour the water and glass in the sock filter. and the frit will get caught by the sock. Once you've caught all the frit, spread it out on a pan to dry. 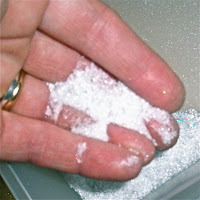 There you have it - You've just made glass frit! 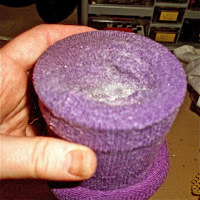 When adding frit into my designs I like to mix it with a glass glue like Glasstac or you can even use Elmers. 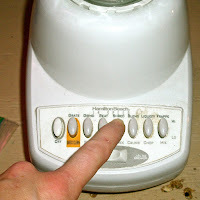 This helps control where your frit goes in your design. Have fun tearing up that old blender!!!! 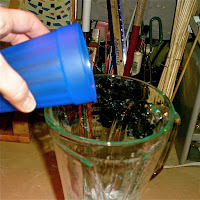 Make your own glass frit. How to make glass frit. Make frit.